Darlington is located in County Durham in the north east of England. The seat was created in 1868 and has been held by Labour since 1992. The current member of parliament is the Labour Party’s Jenny Chapman who has served since 2010. Alan has lived in Darlington for almost 30 years and has worked in and around the town for over 40 years both on the Railways and for the Council; he knows the town and its issues well. 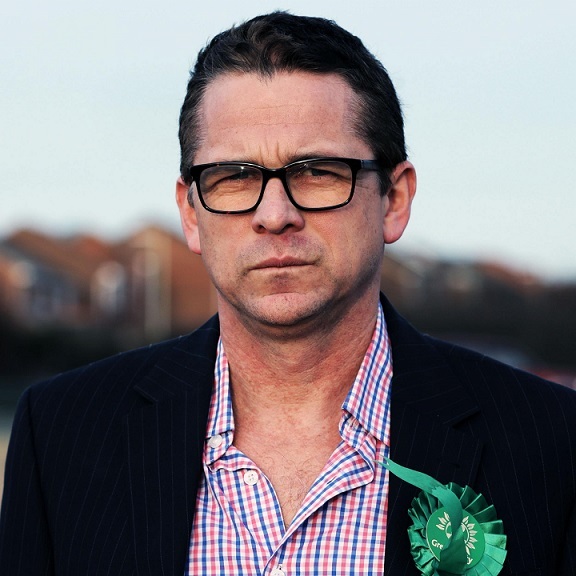 He is the former branch secretary of the Darlington Local Government branch of Unison, is currently the co-ordinator of Darlington Trades Union Council’s Darlington against Cuts group, and Secretary of Teesside Socialist Party. Alan also volunteers for an advice charity. 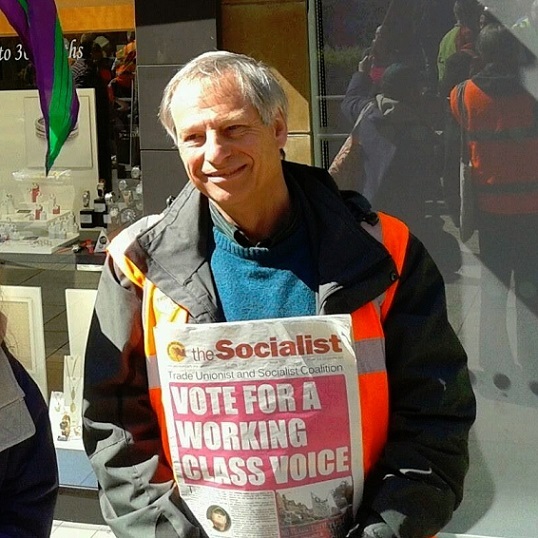 Alan is often seen leafleting and running stalls in Darlington and across Teesside for trade union, anti cuts, and environmental groups. I would take no more than the average wage of my constituents so I will remain economically in touch with them and not aloof on a high wage. 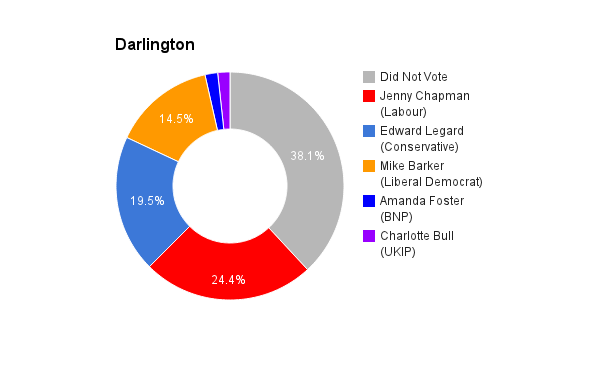 The surplus money will be used to further the interests of the people of Darlington. I would of course hold regular surgeries. I would also set up a branch of our party to which I would be accountable and subject to re-selection. I have lived and worked in Darlington for most of my adult life. I currently volunteer for an advice charity which gives me an insight into problems affecting people of Darlington. I am an active trade unionist and environmental campaigner who cares about the town and its people. I am the Coordinator of Darlington against Cuts and have fought to stop reductions in council services. To be fair Jenny has been a good constituency MP. Austerity is a lie. It is the cornerstone of neo-liberal economic thinking that promotes the free market and a small state. This policy has forced a race to the bottom; ordinary people have had reductions in real wages, worse working conditions, and a cut in social support. In contrast the rich have got richer and the wealth gap is the widest it has been for decades and it is widening. All mainstream parties accept this economic ideology and are committed to more cuts. Only TUSC has socialist policies as an alternative to austerity. Immigration is used by some as a divide and rule tactic to obscure what are the real political issues facing people. Immigrants have been used by some unscrupulous employers to help keep wages down and worsen working conditions. The blame lies with employers not the workers. TUSC campaigns for the rate for the job and for immigrant workers to be welcomed into the trade union movement. Overall immigration is beneficial to the economy and statistics show that immigrants put more in than they take out. Young people are essential to a workforce that has to sustain an aging population. How would the xenophobes cope if we had to support almost 1 million British pensioners returned to us by Spain? Massive public investment in jobs is required. One TUSC policy is ‘One million green jobs to tackle climate change’. The country can afford this! The capitalist economy is not the real economy; it is a gambling casino. We would properly nationalise the banks and use the country’s wealth to train, employ and pay people a decent wage. TUSC demands a minimum wage of £10ph now. End PFI, privatisation, and the market system that is draining the NHS of billion of pounds of funds by paying banks interest payments and additional bureaucracy. The NHS should be restored to Bevan’s original ideal. Free to all at the point of need. The NHS would be more responsive if it was democratically controlled and run by representative of its front line workers, doctors, nurses and technicians. Investment in training, and the creation of jobs, using public expenditure. For example; we have a housing crisis (a shortage of affordable housing) and unemployed building workers. A socialist government would make a real economy work by putting the two together, and using public finance to build homes. Yes, we have a male dominated, public school, and Oxbridge elite running the country. Parliament should be composed of a representative cross section of the population, at least half female and predominately working class. As a socialist I am an internationalist and would campaign for a socialist Europe. However the current institutions of the EU are designed to promote a neo–liberal free trade market to integrate multinational capitalism. I would call for a ‘no vote’ but campaign with other European socialists for co-operation across Europe for political policies to benefit working people. Mike has worked with the community from the cradle to the grave within his volunteering and professional career. He is a family man with four children aged between 29 – 14, and elderly parents, he also has a large extended family too, thus very in touch with the needs of the local community. He has many successes to date including winning countless sporting achievements in athletics. Mike continues to coach children and young people within the local community today, as he strongly believes in giving back to the local community and supporting children and young people. I will make sure that I am available within my constituency and will look to not only hold surgeries but I will go into meet with community groups and also make sure I am visible in the Town Centre and other shopping areas around Darlington so people can bring their issues to me face to face without booking appointments. I will have a dedicated website where people can pose questions and I will answer them on a weekly basis. I have lived in the area for 21 years and I am in touch with local people as I work full-time presently in Secondary Mental Health Services and I also volunteer as a football coach for children. I come from a working class background and worked extremely hard to achieve professional status so I am a real product of social mobility. I think going to fortnightly bin collections when one week is black bins and the other week recycling. Austerity is not working as these measures are shortsighted as they target our most vulnerable people in society and are implemented by those that are out of touch with people. In the long run this will cost even more to the tax payer as people will be in need of more services as the austerity measures are making people lose hope and in extreme cases vulnerable people are taking their own lives. Valid research has proven that immigrants actually add value to not only the cultural diversity that we now have in the UK but bring much needed valuable skills to our economy such as Doctors in the NHS. I also believe that research proves that there is a higher number of UK citizens leaving than those coming into the UK. I think this is an issue that UKIP use to drum up votes stating that immigrants are taking people jobs, although the truth is that immigration has a neutral impact on unemployment. I would ensure that the minimum wage is risen to £10 by 2020 and that 40 Billion pound investment will be made to create a million new sustainable jobs that pay a living wage. I would also subsidised Town centre shop rentals and support local small businesses as we know that a lot of these small and in a lot of cases family run businesses are struggling to compete with the bigger companies. I would ensure that the big corporate companies pay their taxes through the introduction of the Tax Dodging Bill 2015. I would also introduce a wealth tax, taxing those top earners of 100,000 PA. I would ensure substantial investments to allow clinicians to do their job free of the pressures of being under resourced to ensure that all services are free to everyone at the point of entry. I would make sure that the NHS is brought back into public control and put patients first not private companies that are interested in profits at the expense of the care of the patients. I would build back the NHS and create a service that is fit for purpose and patient, carer and family centred. Invest 40 billion and create a million new jobs paying a living wage. Invest in small business sector and subsidises wages for young people so they can gain meaningful employment that will have a direct benefit to the local economy and directly support small businesses that are prominent across Darlington. Yes it is dominated by Conservative and Labour with mainly white males. I believe we need a Party such as the Green Party to balance out discussions and debates and also need more women and people from Black Minority Ethnic communities, disability communities and to better reflect the UK. To listen to the debates and to look at the exploring European position and the need to establish a purpose and meaning for our belonging that benefits the common good not just a minority.